People sometimes ask why I run and my usual answer is to say that I want to stay healthy. In reality, I can trace my running over the past 5-6 years to my parents. Not that they blessed me with good running genes. But that being with them through their health declines and eventual passings motivated me unbelievably to get in shape and stay in shape. You can see this from the chart attached which only shows marathon PRs, not all the 80+ degree marathons J I’ve run. Though the PRs appear to be leveling off, they are not over. I ran a marathon in honor of each of them already so this Chicago is for me. I don’t think I have reached the point where I can’t improve. I’m determined to get under 3:35 and preferably 3:30 this fall in Chicago. I had a good winter training cycle which culminated in a decent PR (3:36:33) at the National marathon in D.C. in March in which I was privileged to meet a few new people plus catch up with some ones I know. That was a tough run at the end. There is one difference this year. In past years, when I was burned (figuratively and literally) by Chicago’s warm weather, I ran Philly as a back-up for PRs. But this time I’ve qualified for Boston 2012 so Chicago is it, then brief recovery, then lots of training for Boston. (We’ll see if I can hold to this if the weather is warm). Well John it has been a pleasure to know you the last few years and see you improve year after year. I have always loved your drive, determination and motivation to strive to be the best you can. I was so excited for you when you got your BQ and look forward to seeing at the finish in Boston! As for going under 3:35 and even sub 3:30 I believe in you and that you can do it. I also think that the Hudson program is a great fit for you right for were you are at as a runner. I look forward to seeing you reach your running goals. So I have to talk about today's workout. First you have to understand I do most tempo runs on the TM because it takes the hills, wind and weather out of the equation, and it works pretty well. However, I decided today to go to the track. On tap was a four mile aerobic test which would effectively be a tempo run. The goal was first two at HMP (about 7:30) and then two at 10K (about 7:12). Not that I've run those times in races. I have traveled so much in the past three years that I haven't done a lot of races other than marathons. Anyway, three miles warm up running to the track - about 9 minute pace. Then came the test. I started running and immediately the pace was too fast, about 6:30-6:45. I tried slowing down but it took three laps to get it under control. The first mile was 7:18, a little fast. I kept it slower and did a 7:24 the second mile. The sun was out and it was a little warm but really was a beautiful day out. After those two miles, which didn't seem overly difficult, I tried to pick it up. Third mile was 7:09 and I was hurting a little bit. Then I got the last mile done in 7:12 and it was definitely a hard mile but it felt so good to have run this workout. This is pretty much my 5K PR pace. I'm going to look for some races in a few weeks to test myself out some more. Two miles cooldown running home, this was a great workout. Saturday - we are moving my daughter to Massachusetts . It will be a big shock to have her so far away but this is a pretty good opportunity for her. I need to get a 13 miler in after golf and before we leave! @Schuey wrote: Well John it has been a pleasure to know you the last few years and see you improve year after year. I have always loved your drive, determination and motivation to strive to be the best you can. I was so excited for you when you got your BQ and look forward to seeing at the finish in Boston! Martin, thanks for your response! I remember meeting you the first time at March Madness and even then, you were so positive and supportive. With my daughter moving near Boston, I have extra motivation to keep qualifying! John, I look forward to meeting you in Chicago. It looks like we have a bit in common between close goal times, working in the rounds of golf, and moving daughters! I'll be following your blog with interest to see what I can shamelessly steal from your training. John, good luck with your training and racing. I hope your determination pays off with a huge PR to add to your chart. THanks Matt, I hope the PR is huge, those are always the best ones. @Tom H wrote: John, I look forward to meeting you in Chicago. It looks like we have a bit in common between close goal times, working in the rounds of golf, and moving daughters! I'll be following your blog with interest to see what I can shamelessly steal from your training. Thanks, Tom, we do seem to have similarities. We'll have to see how our training programs lie up, and compare race times. Today's run was terrible. It was fairly warm here today so I should have gone early morning. But I was invited to a golf outing in the morning. I also had a hard stop at 4:00 PM as that was the time we wanted to leave to drive my daughter out east. It was only a 13 miler today so I figured, how hard can it be? Well, it was a struggle due to the temps, sun, and probably the hot dog and beer after golf. . I don't have the splits but overall, the times were like 9:20-9:30 when they are normally 8:40-9:00. Oh well, not much flexibility for this weekend. Love the new blog and one I want to follow closely. Your marathon times specifically from 2004 on remind me of my progression. I think I also ran a 3:36 at Nationals. I have no doubt in my mind you can and will go sub 3:30 this year. The stats IMO lead to it. Your ready for a big drop in time. Just train hard but smart and execute and we will all be seeing a new PR of sub 3:30 coming soon. John, you inspire me with your hard work and your great running improvements. I have to say that I love your whole first blog entry; the first paragraph in particular. I liked how you said that you have watched your parents' health decline and running is a good motivator for you to stay healthy. I can relate to that, with watching my mom with her heart condition and my granny with her Alzheimer's. I'd like to think that if we stay healthy now, a lot of the bad stuff that starts to show up later in life will stay at bay. I also found your statement about running PR's for each of your parents and Chicago being for you to be very, very powerful. There is just something about that statement that just takes the stage and I love it! It's been great following your runs over the years and I'm looking forward to you running a killer race on October 9th! Gotta love that golf/run/drive trifecta. best wishes on your training! I'm sorry for the loss of your parents. That is great you know you can still improve, you sound like you're following a smart program and you're all set for a PR! John, looking forward to seeing you again in Chicago and hearing about another PR! Good luck with the training cycle! @Mrs. Schuey wrote: John, you inspire me with your hard work and your great running improvements. I have to say that I love your whole first blog entry; the first paragraph in particular. I liked how you said that you have watched your parents' health decline and running is a good motivator for you to stay healthy. I can relate to that, with watching my mom with her heart condition and my granny with her Alzheimer's. I'd like to think that if we stay healthy now, a lot of the bad stuff that starts to show up later in life will stay at bay. I also found your statement about running PR's for each of your parents and Chicago being for you to be very, very powerful. There is just something about that statement that just takes the stage and I love it! You know John, I missed the part in your intro about a good part of your motivation to remain fit came from seeing your parent's health decline. This was the same for me, except it was my Mother in Law and many of the people at her care facility. So many of them had allowed themselves to slip into infirmity it was scary. Perhaps more 40-something folks should spend time at such facilities to calibrate themselves for their own futures. And look where it is taking us now, a love of fitness, the pursuit of PRs, and (speaking for me) a better level of overall health than we've seen in decades. Let's kill it in Chicago! Thanks all, for the great entries here, I'll be responding to them when I get back. . It's been a very long day in that we drove 18 hours to get here, and passed by two terrible accidents. On route 80 in Illinois, traffic slowed to a crawl and then up on the side, there was an empty motorcycle helmet and a smashed bike. No way the rider could live. Then in New York, there was almost an hour delay before we saw what happened, or half of it. One car was there getting loaded up and it's front end was really smashed up. The other car had been towed away. Running wise, I had a six miler on tap today. Siince I didn't know the area (and nearly got hit in Long Island last week out on a run), I decided to use their TM. After one mile, I had to use their facilities. When I come back, some guy is on the stairmaster and letting his kid use the TM. Oh well, out to the roads in New Bedford. Other than construction, they were pretty good, having bike lanes that people generally respected. So I got a solid six miles in but not the short hill sprints. This area seems like a good place for my daughter. She is excited and nervous at the same time. I am those emotions plus concerned. We'll see how it goes. 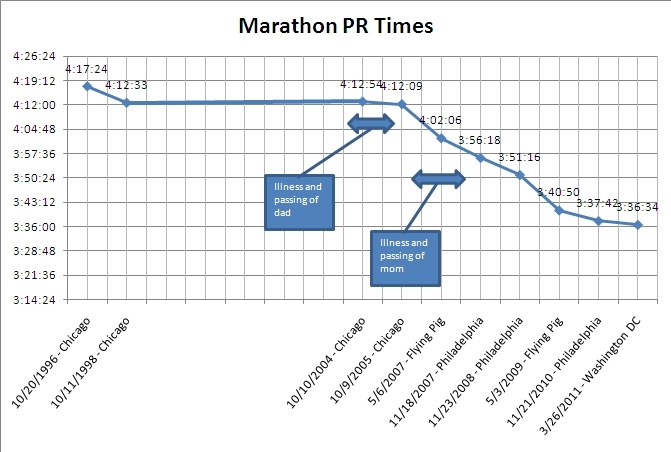 Hi John - I sort of started running for a similar reason - great chart of your PR times - gives lackeys like myself hope! Hey Tom, thanks for stopping by. I agree - use anything shamelessly from the forum, we all learn from each other. See you in October here, make sure to bring a decent jacket as it should be pretty cool then. @John Kilpatrick wrote: Hi John - I sort of started running for a similar reason - great chart of your PR times - gives lackeys like myself hope! Thanks John, though I doubt you are a lackey! Every person is different, it's probably because I hadn't gotten over the death of the first parent before the second parent started her decline, and then deja vu all over again. There are few things in life that have stuck like that, but it is one of them. @Kenny B. wrote: Love the new blog and one I want to follow closely. Your marathon times specifically from 2004 on remind me of my progression. I think I also ran a 3:36 at Nationals. Kenny, thanks for your reply. I do know that we started out similar and have both improved, but you have improved much more than I have. Still I am hoping to get where you are now but I need the patience you have to get there. I usually look at your runs and you are very dedicated. Thanks for the vote of confidence. Hi Lisa, thanks for the response. I think all of us will relate to similar things like this in our lives. Sometimes people complain about the work or how hard it is to have their parents over for a holiday. While I don't say it, I think that they are lucky to have them come over at all. Oh well. Do great on your training runs, we'll both do great, hopefully! @mul21 wrote: John, looking forward to seeing you again in Chicago and hearing about another PR! Good luck with the training cycle! Jim, great PR at Champaign. I will say ditto for you too in everything you said. Thanks. Got back last night, during the wicked thunderstorms. Thankfully everything worked out OK. Basically I'm a day off in the schedule this week plus I'm a little tired from the last four days. This morning, instead of a pyramid workout, I switched to an 8 miler as I was just not feeling it. Tomorrow morning will hopefully be the pyramid. I'll probably have back to back hard days but since they work different areas, it should be OK and I don't do this much. @JohnP wrote: Got back last night, during the wicked thunderstorms. Thankfully everything worked out OK. Basically I'm a day off in the schedule this week plus I'm a little tired from the last four days. This morning, instead of a pyramid workout, I switched to an 8 miler as I was just not feeling it. Tomorrow morning will hopefully be the pyramid. I'll probably have back to back hard days but since they work different areas, it should be OK and I don't do this much. Great job on knowing when to change the run according to how you feel. This is sign of a mature/smart runner IMO (we should all learn from this). Meanwhile your 8 miles look solid judging by the pretty consistent splits and more importantly the steady HR not much of climb there. You should be very happy with this run. I also agree with doing back to back hard day working different areas. I happen to incorporate a lot of these on Tue/Wed combo during my training especially marathon. I think it helps then again I have yet to BQ so who am I to give advice. Kenny's on the money there John. Dave has me do back to back "hard" days during the week with a tempo Tuesday and long run Wednesday, so as long as you get some recovery in, it should be a good combo for you. What does the pyramid workout involve? Is it a ladder type thing? @mul21 wrote: Kenny's on the money there John. Dave has me do back to back "hard" days during the week with a tempo Tuesday and long run Wednesday, so as long as you get some recovery in, it should be a good combo for you. I do tempo long run combo as well. Tue/Wed. Then I love the next day recovery! Thanks Kenny and Jim. It's good to know you do harder workouts back to back successfully. These back-to-back will be the pyramid (today) and then some short LT intervals tomorrow. Then Saturday will be easier, with the long run on Sunday. Also Kenny, my BQ is helped by getting older, don't forget. I think you've made more improvements in actual time than me. I also noticed in looking at the chart that moving time is consistently 3-5 seconds less than the mile split. I guess that is from crossing roads and having to slow a bit for that regularly. Anyway, Jim, the pyramid is a ladder. THe plan called for 1,2,3,2,1,2,3,2,1 intervals at 5K-10K pace with equivalent recovery (34 total minutes). This went pretty well this morning and I tried to do a little faster on the paces than the plan shows.